Central to this strategy, according to Hackett’s research, is executing a strategy set by a centralized team through regional or local teams. A number of characteristics should be considered to meet the unique needs of each organization, including an ongoing category management program, formal CRM approach, Centers of Excellence (COEs) and tactical buy desks. #2: Determine the importance of spend attributes to business needs and identify categories to be managed. The key to determining how to segment your spend categories is all about balance. Operational staff with specialist knowledge of the category should be represented or at least be closely involved. As the chart indicates below, size of spend is a primary determinant, but this can also represent an area in which savings can be easily made. #3: Understand which spend management practices are crucial factors in the success of a category management program. This level of strategic planning will constrain resources that are probably already tight, which is why Brian Churchill, CPSM, Procurement Operations Manager with Amazon, recommends outsourcing tactical procurement work and sourcing in non-strategic categories. This will allow your procurement team to focus on the truly strategic initiatives that will lead to a sustainable category management program instead of being mired in grunt work. Hackett identifies certain practices that contribute to a highly successful category management program, and chief among them is communication between procurement, stakeholders and business lines. Other best practices include data accessibility, and alignment and executive buy-in for key business objectives. Notably, an area of improvement that procurement organizations struggle with is increasing the opportunities for procurement leaders to network with other business executives. #4: Evaluate and implement technology solutions that enable procurement to optimize category management programs. 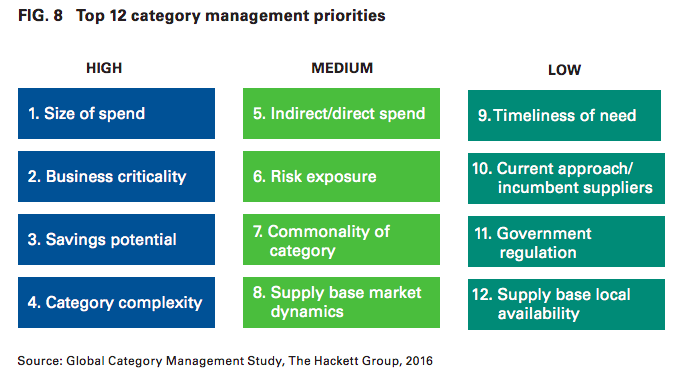 Hackett’s research recommends enabling category managers through software to create and maintain a successful category management program but also notes that most software lacks the ability to bring all the information together in one dashboard. Category managers should take note that supply chain software is increasingly being targeted by hackers who are injecting malware into the software. When looking for supply chain software to complement a category management program, ensure the vendor follows industry best practices. With supply chain attacks costing upwards of $1.2 million, it’s a step you can’t afford to miss. Looking for more category management resources? Check out the SIG Resource Center for templates, presentations, business cases, whitepapers and strategies to help you build your category management strategy.